One of my favorite oenophilic pleasures is getting to taste wines from new wineries or wineries of which I wasn’t previously aware. While the kosher wine world is growing on a massive scale, it’s relatively rare for me come across a respectable winery whose wines I wasn’t previously aware. For the most part, as with the subject winery of this newsletter, this usually occurs with a previously non-kosher winery transitioning to kosher production (which is happening more frequently these days as with Flam and Saslove) or creates a kosher “run” of a select wine. On my recent trip to Israel I found myself really enjoying a 2009 Rose wine from the Agur winery and took it upon myself to search out and taste some of their other wines; which I also really enjoyed. Agur is a growing boutique winery that is currently producing around 30,000 bottles annually and became kosher for the 2007 vintage. 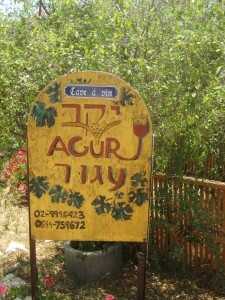 Owned by its winemaker – Shuki Yashuv – and located on Moshav Agur in the increasingly famous Route des Vins of the Judean Hills, the winery currently produces four wines – Blanca, Rosa, Kessem and Special Reserve. Marching in the face of the growing obsession with terroir¸ single vineyard and varietal wines; Shuki strongly believes that wines need the intervention of the winemaker to become great and is an absolute believer in the art, science and requirements of blending. While I am not sure I agree with him, especially given some of the recent raging success for single vineyard wines like the opulent magnificence of the 2003 Yarden Elrom, I hear what he is saying and respect his vision. You also cannot argue with the end result – his delicious wines. In general, the Special Reserve and Kessem wines are blended from the same varietals but in different proportions and are harvested from different plots (or even rows) in the vineyard. The Special Reserve also typically benefits from some extra barrel aging. The refreshing Blanca wine is made from assorted batches of Viognier that are picked at different times, each lending unique characteristics to the wine, all of which are then blended with some Johannesburg Riesling. The delightful Rosa is fermented in used barrels of French oak. While the winery maintains that no wine is their “flagship” and Shuki professes to enjoy making the Rosa over the other wines, it’s the Special Reserve that would probably end up wearing that mantle if required. Unfortunately, the only kosher Agur wine I have found in the United States is the 2007 Kessem which, while good, is probably the Agur wine I enjoyed the least. I remain hopeful that additional wines will make their way to our shores and become more readily accessible. In the interim, I highly recommend picking up a few on your next trip to Israel (or convincing someone to schlep back a couple bottles) – you won’t regret it. Agur, Kessem, 2007: A medium bodied wine that I would deem a “super-quaffer”; meaning a wine meant to be enjoyed with food and not excessively pondered, but with more complexity than a regular table wine. The bottle I tasted came directly from the store’s personal collection and was probably at its peak, so I’d drink any remaining stocks you may have over the next six months or so. An easy drinking blend of Cabernet Sauvignon (40%), Merlot (30%), Petit Verdot (20%) and Cabernet Franc (10%) with blackberries, currants and raspberries mingling nicely with smoky oak and hints of vanilla showing from the oak-aging. Good balancing acidity keeps things upright. Hints of pungent earth and spices complement the fruit and round out this wine. Agur, Special Reserve, 2007: I actually have a bottle of the 2008 (Shmittah year) Special Reserve sitting in my Israeli cellar but didn’t get a chance to drink it during my visit (too many wines – too little time). If its older sibling is any indicator, I am in for a treat when I do crack it open especially given Israeli Shmittah wines seeming proclivity to greatness. A robust and full-bodied blend composed of the Kessem’s varietals but in different proportions (Cabernet Sauvignon (50%), Merlot (35%), Cabernet Franc (10%) and Petit Verdot (5%)). Plenty of blackberries and currants but also green notes of bell pepper and eucalyptus. The same earthiness as the Kessem but to a lesser degree as anise, more warm spices and mocha came are evident, as well as some nice steely/minerally elements. I won’t be opening my other two bottles of this wine for at least 1-2 years as the wood and fruit are still dating and need some getting acquainted time in order to be the delight they can be together. Agur, Kessem, 2008: Same varietals as the 2007 but in strikingly different portions with substantially more Cabernet Sauvignon (65%) which makes itself noticed early and often without overwhelming the wine. As usual, each component was fermented in stainless steel then aged in old French oak for six months. A nose redolent of tangy raspberries and currants with hints of spring flowers; all of which present on the palate as well. The fruit is joined with cutting herbaceousness, anise and cracked black pepper, with well integrated tannins that present a wine approachable out of the glass but that will also continue to improve over the next couple years – always a winning combination. Agur, Blanca, 2009: The most interesting of the bunch, this wine is comprised of 65% Viognier and 35% Johannesburg Riesling – a varietal that I rarely come across as a blending agent. Shuki harvest three separate plots of Viognier at different times (including some late harvested grapes), which were then blended with the Riesling resulting in a delightfully refreshing wine at a surprisingly low alcohol level of 11.5%. Characteristically true flavors of green apples and apricots on a slightly creamy background buoyed by melon, limes and fresh flowers. A young fresh wine with cutting acidity and a backbone of minerals I find typical of many Jerusalem Mountain-grown wines. Agur, Rosa, 2009: Made with by the Saignée method with a 40/60% split of Cabernet Sauvignon and Cabernet Franc grape, this wine has a relatively flat nose of fruit without the exuberant berries bursting forth that I usually love in a Rosé. However, there is plenty of fruit (including raspberries, strawberries, cherries and cassis) on the nose together with bracing acidity and a medium finish to round it out making for a delightfully refreshing wine which was greatly enjoyed during the oppressively hot late summer months Israel recently experienced.